Nigeria's Minister of Transportation, Rotimi Amaechi, has reportedly rescued a kidnap victim along a road in Rivers state. 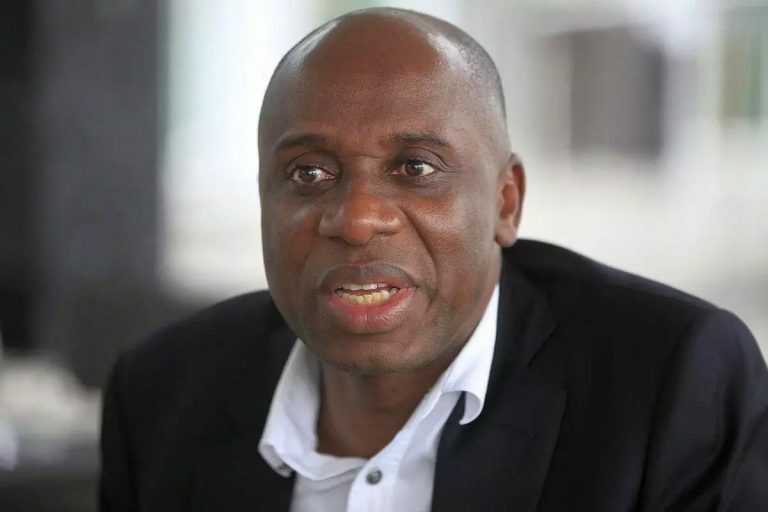 Chibuike Amaechi, a former governor of Rivers State and current Minister of Transportation, on Sunday afternoon, reportedly rescued a kidnapped victim along the popular Omoku/Egbeda road in Rivers State. According to Daily Sun, Amaechi was on his way to Ubimini Computer of Emohua Local Government Area to address All Progressives Congress (APC) supporters, when he sighted a Lexus (SUV) abandoned in the bush. Amaechi, who was leading his convoy, consequently, stopped by and ordered his security team to comb the forest in search for the occupants of the vehicle. The Daily Sun gathered that it was during the search that the security personnel in the minister’s convoy rescued one of the occupants of the Lexus Jeep. The victims, according to community sources, were APC supporters attending the Permanent Voter’s Card (PVC) sensitisation rally in Ubimini, where the minister was to address party supporters. Narrating his ordeal to Amaechi, the rescued victim, Edi Chinda Edi, said they were on their way to Ubimini for the APC programme, when the hoodlums barricaded the highway and attacked them. Edi said the kidnappers were armed with AK47 rifles and other dangerous weapons, adding that he escaped from the bandits by divine intervention, while others are still in their custody. Worried by the safety of other victims who were yet to be rescued, Amaechi was said to have directed some of his security personnel to continue with the search and ensure that the remaining victims were rescued and their abductors arrested and prosecuted according to law.